Renowned for the tall towers they built for their families in the Caucasus, the Ingush have survived Stalin-era reprisals, an armed conflict with neighboring Ossetia, a Chechen war, and founded numerous diasporas in European and major Russian cities, but they have still not mastered either crafts or trade. Ingushetia’s Dzheyrakhsky District is a mountainous area, where altitudes vary from 4,000 to 6,600 feet (1,200 to 2,000 meters) above sea level. These mountains can tell you more about the Ingush people than any encyclopedia. It is here that the famous Ingush family towers are located. There are about 200 spots in Dzheyrakhsky District where these medieval towers can be found. The biggest of them, Egikal, comprises over 40 towers. These mountains helped the Ingush to survive during the Mongol invasion of the North Caucasus in the 14th century. Back then, the Ingush fled from the valleys into the mountains and built their family towers, and next to them their houses, and family tombs nearby. Another historical event that has left an indelible mark on the fate of the Ingush people was their 1944 deportation by Stalin to northern Kazakhstan. Although accusations of collaboration with the Nazis and deportation affected other people of the North Caucasus too, it is believed that the Ingush suffered the most because upon their return and rehabilitation in 1957, their land had been partially occupied by their neighbors, the Ossetians. The bloody Ingush-Ossetian conflict that followed in 1992 resulted in many Ingush people having to move to other republics and settle in large Russian and European cities. “Nearly every Ingush has relatives in Moscow. There has been a large diaspora in the Magadan Region since during the Soviet years and in the 1990s, the Ingush worked there in gold mining and in timber processing. There are many Ingush working in northern Russia, in the oil processing sector,” says Khasan Nalgiyev, an ethnic Ingush, a businessman and the founder of the Tesham charity fund. There are about 700,000 Ingush in the world, with only 375,000 of them living in their native Ingushetia. There is no open data available on how many Ingush there are living in European countries, though local residents say that one of the most popular emigration destinations among the Ingush is Belgium. The biggest Ingush diaspora abroad is in Turkey, with 85,000 people. “The Ingush continue to leave still: There is high unemployment here [over 30 percent, the highest in Russia] and wages are low,” says Ramzan Tsurov, a writer, the author of the anthem of Ingushetia and a tour guide in Dzheyrakhsky District. “It also has to do with the national character: We are not good at trade, like the Armenians or Azerbaijanis are. We do not have a predominant craft… Here in the republic, the best developed sector is agriculture,” Tsurov continues. The Ingush have always been rather poor, he says. It is their unity and solidarity that has helped them to get by. Tsurov explains that the Stalin-era deportation dealt a severe blow to the Ingush nation. Dzheyrakhsky District is the hope of Ingushetia’s tourist industry. Not a long time ago, a skiing resort, Armkhi, was built here together with a dozen hotels for tourists. The inflow of tourists into the republic grows with every passing year. Since the start of 2016, Ingushetia has received 39,400 tourists, which is 24 percent more than in 2015. But the paradox is that there is a shortage of people willing to take up jobs in the services sector. 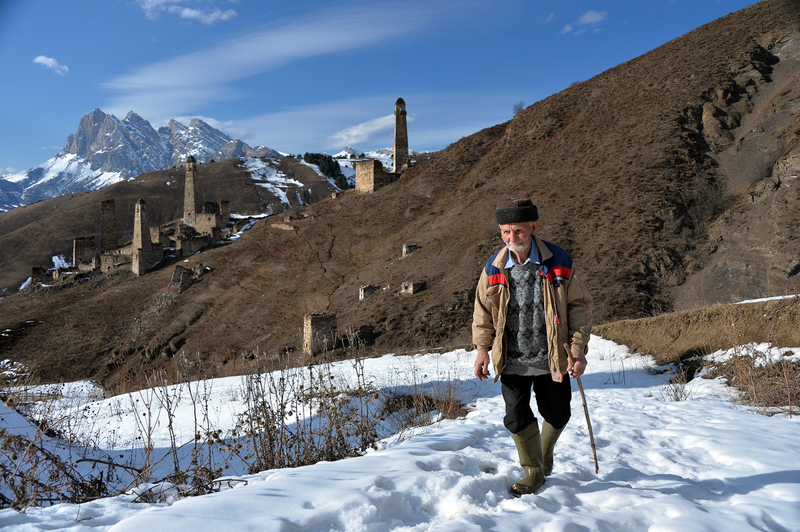 Tsurov reveals another peculiar feature of the Ingush people, the one that helped them create their impressive historical legacy – the family towers.